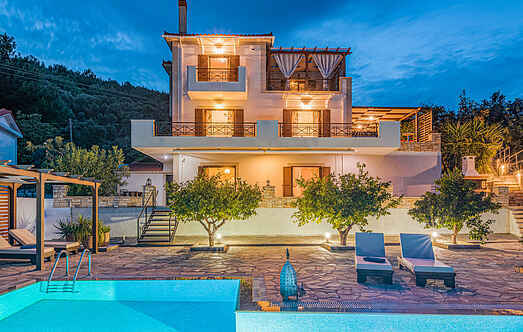 Find a vacation home to rent in Decentralized Administration of the Aegean from our list of vacation rental properties. Campaya has over 23 vacation homes available in Decentralized Administration of the Aegean, which give you the possibility to locate a unique accommodation in Decentralized Administration of the Aegean which completes your check-list in search for the perfect self catering vacation apartments in Decentralized Administration of the Aegean or vacation villas in Decentralized Administration of the Aegean. This stylish vacation house GSM100, is located close to the picturesque village of Kokkari in Samos. Visiting the Cycladic island of Andros, only two hours away from the port of Rafina, you will find Campaya house GKA123. It is a typical Cycladic style house overlooking the bay of Korthi. Beautiful apartment situated in Panormos fishing village in the famous island of Tinos. Nested in the green slope of Stenies village, GKA121 is a perfect holiday home for your perfect holidays in Greece. In the island of Chios right on the beach of Agios Aimilianos this beautiful villa will be the perfect getaway place for your holidays. Unique villa, stone's throw cosy village Megalochori, tranquillity and space. 2 Bedroom room villa with shared pool on a small complex in Rhodes.